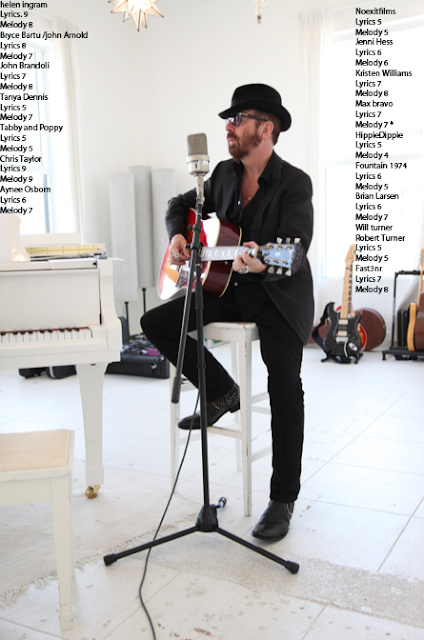 The Geek Muse: The Dave Stewart Twitter Song Writing Competition: The Results Are In! The Dave Stewart Twitter Song Writing Competition: The Results Are In! Wow, now that was a surprise!! Not bad for two hours on a lazy Sunday afternoon with a notepad, a few creative brainwaves and a laptop mic, eh? Yes, I admit that I am gutted that I lost out on the chance to have Dave record the track, especially since I greatly admire his work and there was only one point between us on his scoring system! (see scoring sheet below). But the experience has been priceless. I’ve always been a keen writer, both creative and academic, and I desperately love making music (most of you will not know that I am a grade 8 pianist, a saxophonist and violinist). Maybe the obvious has been right in front of me all along: I should combine the two and try my hand at songwriting…? This is my first attempt at putting pen to paper (or lyric to note, rather) and I realise that it is a huge business and I have no idea where to begin, but I enjoy a challenge and Dave Stewart has certainly provided the motivation and inspiration for me to pursue the goal. Thanks again to everyone for their support and showing their love for the track – and watch this space!